This is a long overdue post here on E-nklings. But I wanted to get it up and out for anyone who is interested in good reading, good books, and good story-telling. 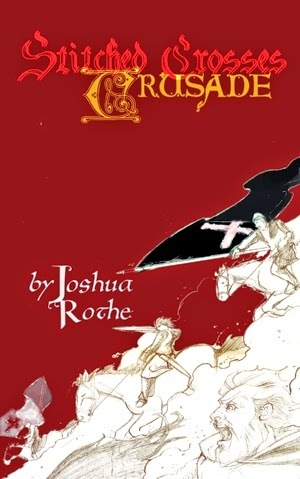 The author's name is Joshua Rothe, the book's title is Stitched Crosses: Crusade, and here's a short little review I wrote about it. I certainly hope this is the first of more to come....First of all, my knowledge of this era in history is woefully inadequate. It revealed a lack of awareness on my part about the events portrayed. However, I suppose that is what a book worth reading ought to do, to reveal, educate, and delight. Thankfully this is where the prose helped me in learning along with enjoying the story. It also made me want to read more about this time in history as well as stories of similar genre. Secondly, I greatly appreciated the attention to detail both in the action as well as in the explanation of particular Christian practices. Whether one has knowledge of these or not, it helped the reader. Third, the doctrine of vocation, I thought, rang throughout the book as well. Fourth, I loved the last part where you explained the history and meaning of the word 'crusade'. That shed a light on the rest of the book and I was glad I read it first since it out my mind in the right frame for all the aspects and facets of 'crusade' which were present in the book and in Markus especially. And lastly, this story has a way, in fact many ways, of giving the reader a glimpse of the one, great true story: the Gospel. The reader is drawn into a world of historical narrative, with knights, honor, adventure, and redemption, in order to shed light on the great redemption and restoration to life in Christ. Sermon for the Feast of St. Matthew: "Follow Me"